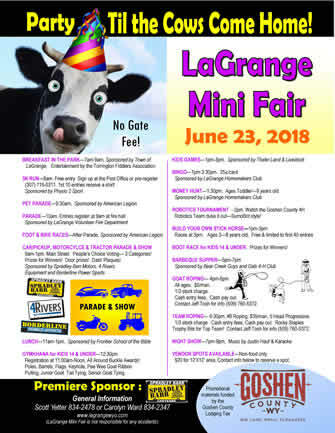 LaGrange Wyoming Mini Fair - Includes local 4-H clubs, Gymkhana, Lagrange pet parade, ranch rodeo and more! The LaGrange Mini Fair was started to show off 4-H club member’s projects to the local community. It has continued to grow for the past 45+ years. Today there is a pancake breakfast, parade, gymkhana, 5k run, car show and much, much more. Come out to experience a full day of family fun. The LaGrange Mini Fair is the place to see all the action! See more pictures of Mini Fair.